Artistic design is useful in addressing policy issues because it can provoke new ideas and actions. A volunteer IRAAA+ contributor, Khia Jackson, had a full agenda for her business when she began contemplating visual designs about criminal justice issues. 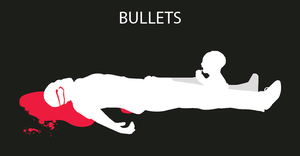 After launching the platform for her graphic design firm on August 3, 2016, she made time for her volunteer work and created the "Shots Fired, #1 and #2" graphics shown here. One of the key questions about this issue is: Why do public safety officiers need to rely on guns when there are so many other technologies and tactics that could be used to apprehend people and to defend themselves with equal, if not greater, efficiency, and with no fatalities? Police interact with people whose conditions range from mentally incompetent, immature, inebriated, angry and desperate to sober, sane, calm and compliant. Many fatal police shootings have involved persons being apprehended for theft, traffic violations, and misdemeanors like selling CDs on the street. In such routine policing, guns are archaic, overkill devices given this nation’s achievement in the design of other kinds of equipment that is finely tuned to perform its functions. 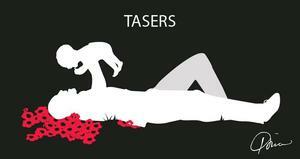 If there are pros and cons to taser use, engineers and industrial designers should collaborate with public safety officials in developing non-lethal, state-of-the-art devices and tactics for 21st century policing. Lower-income areas get much more police attention than other areas because problems arise from hardships. That's another issue — one that would require sweeping social and economic strategies to address. 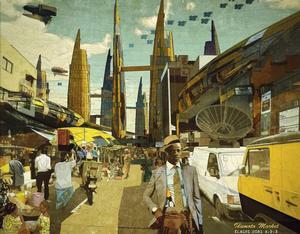 Designers and other visual artists also could have a role in addressing that big challenge. Leslie Xia, a New York City-based graphic designer, responded to the issue with her “Say Their Name” campaign to commemorate victims of police shootings. She raised funds for it though Kickstarter. "The purpose of the 'Say Their Name' campaign is to cover the streets of NYC and major cities with the names of the lives lost to police brutality. Each of these stickers are designed by a POC artist, and the funds from the Kickstarter will go directly to the production of these stickers, and the talent of these artists." Her full statement is here. 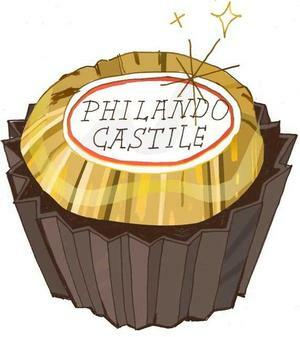 The funding campaign exceeded its goal. Donors to the fund receive the sticker decals and will help plaster the towns with stickers to keep their cause front and center while commemorating the deceased victims. Rem’s buttons didn’t have his name of them but his signature was all over them. 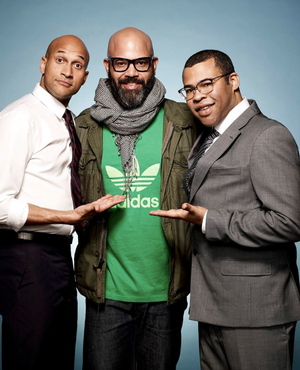 Arem Duplessis (known as “Rem” to his Hampton homies) was one of 45 artists and graphic designers invited by the Hillary Clinton campaign to create button designs. On the page displaying Duplessis' buttons, he's identified as “a graphic designer living in San Francisco.” His specific title is cross-functional creative director for world-wide marketing for the Apple corporation. Describing the Duplessis style in a 2014 IRAAA+ article, Toni Wynn said his "design knack is to telegraph the point of an article in clever, visual shorthand.” She was referring to the The New York Times magazine whose design he directed but this description also applies to the buttons. Wynn saw how the Apple advertising aesthetic echoes the Apple product design aesthetic and was a natural fit for Duplessis’ style: "clean = cool." That quality also can be seen in Duplessis’ design for Hillary Clinton buttons. The Arem Duplessis news came to our attention from Mary Lou Hultgren, former Hampton University Museum director and curator. She was a friend and colleague of Rem’s late mother, Laurel Duplessis, and watched Rem come of age on Hampton's campus. Hultgren says her own son, Aaron, “really found the simplicity of the (button) design powerful." He discovered them while looking for buttons to order for his nine-year old daughter to wear during the momentous 2016 election. 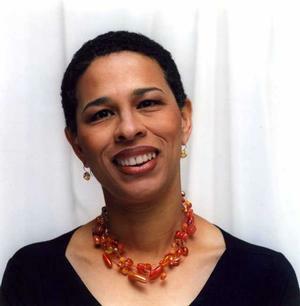 Sylvia Harris (1953 – 2011) owned a Brooklyn NY-based environmental branding, way-finding and mapping design firm that served clients for public projects such as airports, universities, hospitals and cultural centers. Her other work included analysis and strategies to make information such Medicare media and U.S. Census forms easier to understand. 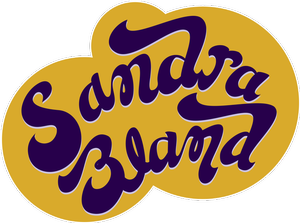 And she was involved in more traditional forms of graphic design as an advisor to the U.S. Postal Service for the design of postage stamps. Sylvia Harris also developed a strong personal interest in non-profit, social impact design projects and became a well-known advocate in that field. To honor her legacy by supporting exemplary design that enhances public life, the Sylvia Harris Citizen Design Awards of $10,000 were established by her estate management in cooperation with two design organizations — Design Ignites Change and the American Institute of Graphic Artists (AIGA). The first Sylvia Harris Citizen Design Award went to the Corbin Hill Project in 2014. Sylvia bristled at how wholesome food is rarely accessible in low-income communities. She had long advocated for infrastructure that would afford people of all backgrounds the benefits of whole, unprocessed food. Corbin Hill does this by bringing produce from upstate New York and distributes it to underserved neighborhoods in the Bronx and Manhattan. In December 2015, the Sylvia Harris Citizen Design Award went to the non-profit, Gma Village of Oakland, California. Gma connects low-income parents with grandmothers for childcare. It’s a win-win system that empowers everyone involved. The design that goes into these two projects, on strategic, aesthetic and community levels, represent the highest aspirations for design, as Sylvia Harris saw it: to serve, inform, and empower the public. We noted reasons for the mounting speculation that David Adjaye Associates would be selected to design the Obama Presidential Center, in an article last year. In December 2015 Adjaye's firm was one of seven firms chosen to submit proposals (from among 140 firms submitting qualifications). However on June 30, 2016 the Barack Obama Foundation announced that the New York firm of Tod Williams Billie Tsien Architects (TWBTA) was selected to lead the design of center that will be located in Southside Chicago. They will partner with the local Interactive Design Architects (IDEA) firm in multiciplinary work that will include a number of other firms. 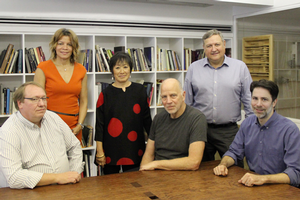 IDEA, a group of nine architects, is headed by Dina Griffin. When she became president in 1999, IDEA became an MBE (minority-owned business enterprise) and a WBE (woman-owned business enterprise) firm — a smart move on the part of Griffin and the white male founders to optimize their opportunities for contracts. "I know Dina and she has been very involved in NOMA and helping young people," said Bradford Grant, a full professor of architecture at Howard University, when he heard about the architect selections for the Obama Center. ("NOMA" is the National Organization of Minority Architects.) 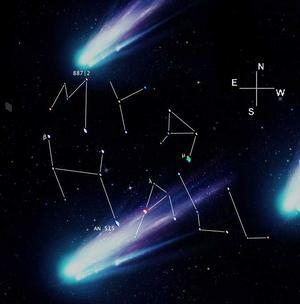 "She has gained note in connecting with big name architects to assist her firm with major commissions. I was not aware that her firm is mostly non-black." Marty Nesbitt, president of the Obama Foundation, explained how Tod Williams Billie Tsien Architects and IDEA are uniquely suited to realizing this vision in his announcement of their selection. David Adjaye, the London-based, Ghanaian architect who has designed buildings in Europe, the U.S., Africa,+ Asia and the Middle East, continues to extend his international credits. On June 30, 2016, when the architects for Obama Presidential Library were announced, Adjaye probably was not much concerned that he did not make the final cut. 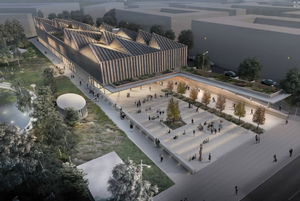 Just a few days earlier the Latvian Museum of Contemporary Art Foundation had announced that Adjaye Associates was the winner of an international competition to design a new contemporary art museum for the Riga city center. The Foundation chose Adjaye Associates' proposal for the building based on reasons that included “the team’s understanding of the material presence of north light in the region, and how this can be inspirational, both for the experience of art and also for artists’ practice." The jurors' full statement is here. 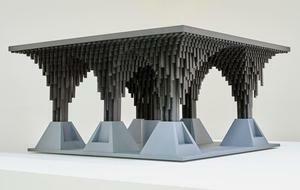 Adjaye will work with a Latvian architectural team on the project. The boldly colored, geometrical design of the Ndebele women of South Africa gained broad recognition in the 1990s when Esther Mahlangu — their leading artist who usually paints compound walls — painted Ndebele design on a new BMW car. Two years ago we reported on Esther Mahlangu’s large-scale commission at the Virginia Museum of Fine Arts and was amazed to learn about the rigor of her technique. That article is here. 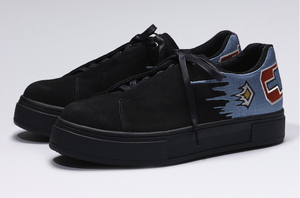 In late February 2016, Eytys, a Stockholm, Sweden shoe and handbag company, introduced two versions of their Doja sneakers embroidered with Esther Mahlangu’s designs. The sneakers — collectible wearable art — have sold out. Eytys currently is featuring a spread set on the streets of Johannesburg in its website “Footnotes” series. 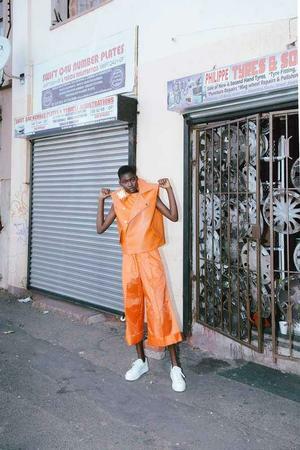 Photographer Kristin-Lee Moolman and stylist Gabrielle Kannemeyer created the spread showing black South African musicians and models wearing apparel by local designers such as Thebe Magugu, Rich Mnisi and Boyz ’n’Bucks, and Eytys shoes. Esther Mahlangu’s designs also were on view at Making Africa – A Continent of Contemporary Design at Guggenheim, Bilbao, Spain (October 30, 2015 – February 21, 2016). The exhibition of object and furniture design, graphic arts, illustration, fashion, architecture, urban planning, craft, film, photography was organized by the Guggenheim Museum Bilbao and Vitra Design Museum, in collaboration with the German Federal Culture Foundation and the Art Mentor Foundation Lucerne. 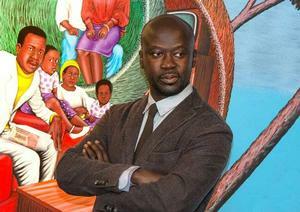 On first glance Adjaye's stark, coloristically dark and monochromatic structures appear unfriendly, she said. "They are minimal, severe and rectangular, representing a new kind of urban house" (or in the station case, a new kind of public shelter). "But certainly they cannot be ignored for their effect is like seeing a monumental modernist sculpture plunked down amidst pedestrian architecture." 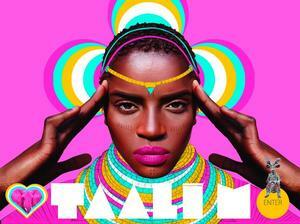 Pierre-Christophe Gam’s “The Kingdom of Taali M” graphic for the website of the Parisian-Congolese musician Taali M looks more inspired by South African Ndebele jewelry and house painting design (rendered in neon colors) than by the Congolese Kuba style. But the entire continent is engaging in a design conversation with its constituent parts as well as with other parts of the world. And the exhibition curators noted the role of non-traditional forms of media in fueling that transformation: "Social media, blogs and YouTube are used as a stage for self-expression by a young generation of Africans who regard themselves quite naturally as part of a global culture." 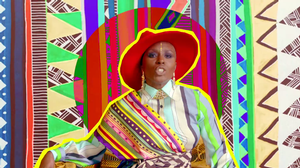 A global African design aesthetic is vibrantly exemplified in Laura Mvula’s Phenomenal Woman video that was released in May 2016 via Vevo and YouTube. 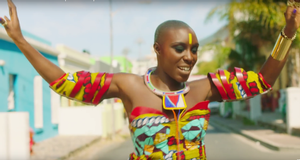 Laura Mvula (nee Douglas) is from Birmingham England but her relations are international. Her parents are from the Carribean (St. Kitts & Jamaica) and she was married to a South African who she met while studying for her bachelor’s degree in composition at a Birmingham conservatory. Her Phenomenal Woman video is based on the poem of the same name by the African American poet Maya Angelou. It was shot on a street of colorfully-painted houses in the Bo-Kaap section of Cape Town, South Africa. 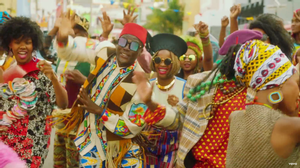 The male dancers in the video are a Mozambican group. 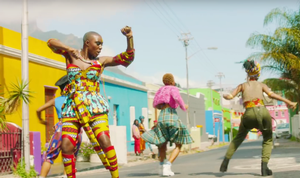 The clashing yet harmonizing colors and patterns of the performers’ costumes are like the energetic prints and patchwork of Nigerian-born, London-based fashion designer Duro Olowu. 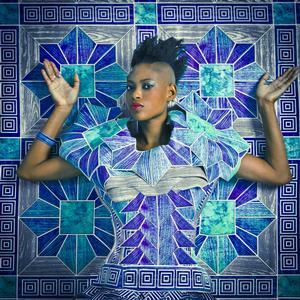 Mvula’s costume is a combo of traditional (the Masai collar necklace) and fantastical. 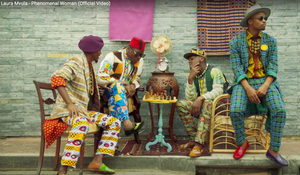 The Phenomenal Woman video exemplifies the design sensibility emerging from a 21st century, African Diaspora global culture, propelled by continuing advances in mass communications. The song is on Mvula’s Dreaming Room album released in June 2016 through RCA Records. Despite the dazzling breadth of African Diaspora visual culture and Africanesque representations of women in contemporary design, the popular image of the black woman still often coalesces around a narrow, hybrid form of beauty. Politically astute Beyonce understands this skewed dynamic and is trying to project a broader representation of black feminine beauty in her videos.